Hundreds of people have arrived at Tirat HaCarmel to comfort the family of 1st Sgt. Gal Kobi, who will be buried at 4:00 p.m. Hundreds of people have arrived at Tirat HaCarmel in the North of Israel, near Haifa, to comfort the family of First Sergeant Gabriel (Gal) Kobi, killed by a Palestinian Authority (PA) terrorist in Hevron. The IDF Spokesperson has said the funeral will take place on Monday at 4.00pm at the military cemetary in Haifa. Gal Kobi (20) was shot by a PA sniper on Sunday evening at the Avraham Avinu neighborhood, near the Machpelah Cave in the city. 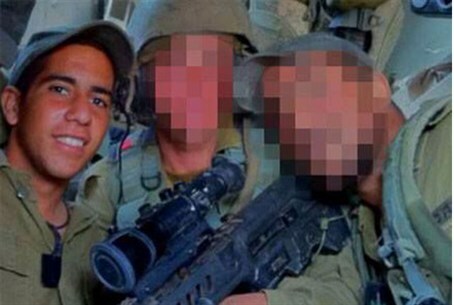 One of Gal's friends, who studied with him at the Shipman School before his enlistment to the army, told Israeli newspaper Yisrael Hayom: "Gal was an amazing son to his parents, a wonderful brother and a good friend. He was the salt of the earth. Gal was so motivated about the army and always dreamed of serving in the Givati Brigade." He added "When I heard that he was critically wounded, I prayed he would pull through. I and all of his friends don't believe that we won't see the smile that was always spread across his face. He was always so optimistic even during the hard times. It is such a big loss to his family, the state and to all of us." Gal is survived by his parents Smadar and Oved Kobi, and two younger brothers. The time of his funeral is set to be announced shortly. Following the murder, Prime Minister Binyamin Netanyahu ordered on Sunday night that steps be taken immediately to resettle the Beit Hamachpela in Hevron, a home bought legally by Jewish families in the Avraham Avinu neighborhood. Previous defense minister Ehud Barak ordered the house to be evacuated but a court ruled that the Jewish residents could return to the home.